Bronchorrhea is one of late complaints in patients with bronchioloalveolar carcinoma (BAC) and hampers their quality of life. Although an effective treatment for bronchorrhea in these patients has not been established, recently we have treated effectively one case of persistent bronchorrhea associated with clinical recurrent BAC with gefitinib (ZD1839, 'Iressa™'; AstraZeneca Japan; Osaka, Japan). A 63-year-old Japanese female had undergone left pneumonectomy with radical lymph node dissection (ND2a) for diffuse type bronchioloalveolar carcinoma originated in left lower lobe. Multiple pulmonary metastases in right lung were found one year after operation. Pulmonary metastatic lesion has grown and she complained of progressive symptoms of massive watery sputum and dyspnea, four years after operation. Although her symptom was getting worse in spite of routine treatment, it completely disappeared within 2 weeks of starting oral gefitinib. Thereafter, she has been symptom-free and shows good partial response on repeat scan after 9 months of oral gefitinib. The dramatic remission of persistent bronchorrhea by gefitinib in the presented case suggests that gefitinib might be a promising option for bronchioloalveolar carcinoma, particularly in cases with severe bronchorrhea. Although it is not possible to comment on whether the improvement came from tumor cell death itself or suppressive effect of mucin synthesis by the epidermal growth factor receptor-tyrosine kinase inhibitory action. Gefitinib is an oral active, selective epidermal growth factor receptor-tyrosine kinase inhibitor (EGFR-TKI) , which was first approved in Japan for patients with non-small cell lung cancer on July 5, 2002. It is very interesting that gefitinib is more effective in female patients with adenocarcinoma than the others . We describe here case of a female successfully treated with gefitinib for her persistent bronchorrhea due to recurrent multiple pulmonary bronchioloalveolar carcinoma (BAC) following left pneumonectomy. 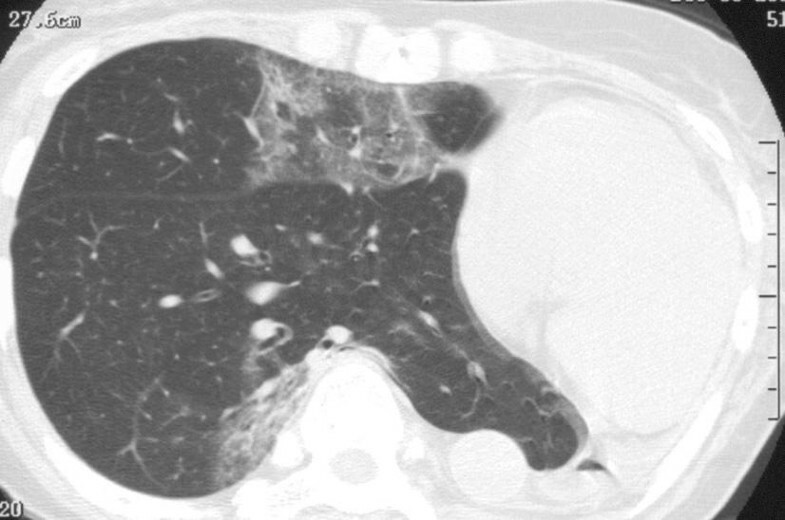 A 63-year-old Japanese female underwent left pneumonectomy with radical lymph node dissection (ND2a) on March 16, 1998, for diffuse type BAC originating in left lower lobe, which was p-T2N0M1, stage IV disease with intrapulmonary metastasis to left upper lobe (pm2). She was thereafter followed with oral UFT (5-FU derivative "tegafur" and uracil at a molar ratio of 1:4; Taiho Pharmaceutical Co., Ltd., Tokyo, Japan) at 400 mg/day, because she refused to be treated with adjuvant intravenous chemotherapy. On March 12, 1999, multiple small pulmonary metastases in the right lung (S5 and S6) were found on a follow-up computerized tomographic scanning (CT), although she was asymptomatic. As these pulmonary metastases have grown slowly but constantly, oral etoposide 25 mg/day was added since April 10, 2001, she refused the usage of intravenous anti-cancer agents. She gradually developed productive cough and dyspnea since July 2001. 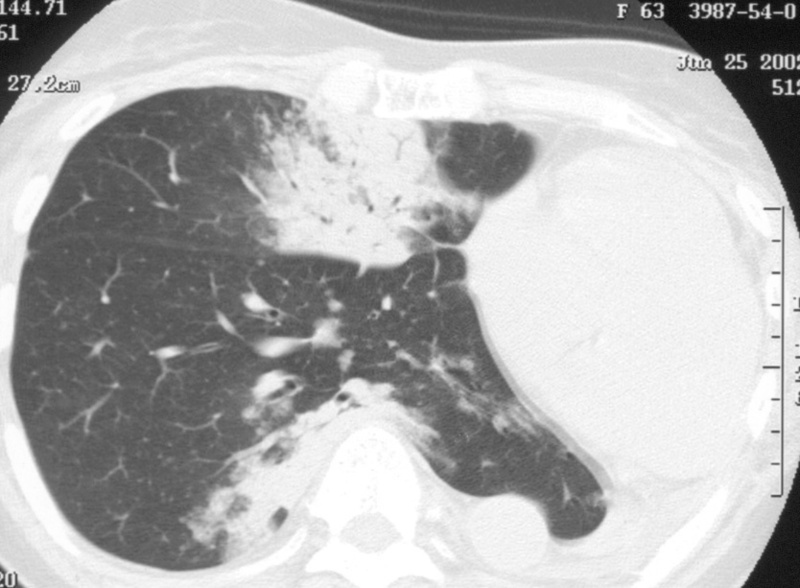 Chest CT on June 25, 2002 revealed multiple pneumonia-like consolidations on each lobe of the right lung (Fig. 1). Chest CT scan taken on June 25, 2002 showing the lesion. Although sputum cytology failed to prove a definitive pathological diagnosis of recurrence, her symptom and radiological findings had never improved by antibiotics, steroid and with interruption of oral anti-cancer therapy. Because she had complained of progressive symptoms of massive watery sputum and dyspnea, she was started on oral gefitinib 250 mg/day on October 8, 2002. Her symptoms dramatically improved along with disappearance of the abnormal diffuse shadow on chest radiograph two week later. On December 3, 2002, 8 weeks after gefitinib was started, almost complete remission of diffuse pulmonary cloudy shadow was confirmed on chest CT (Fig. 2). Chest CT scan taken on December 3,2002, 8 weeks after gefitinib was started. She is taking daily 250 mg gefitinib for 9 months and had been very well without any signs of tumor progression or adverse side effects. Gefitinib is an orally active, selective EGFR-TKI that blocks signal transduction pathways implicated in proliferation and survival of cancer cells . Although the mechanism has been uncertain, the response rate was significantly higher in adenocarcinoma and female patients than in squamous carcinoma and male ones in clinical experiences with gefitinib for lung cancer including two randomized double-blind phase II studies (IDEAL 1 and 2) [2, 3]. As clinical experience in Japan thereafter shows same tendency that gefitinib is more effective in female patients with adenocarcinoma, we tried gefitinib in this case. The response was somewhat more rapid and powerful than we expected. It is also true that the clinical effect is evident within the first few weeks if sensitive to gefitinib . Although we have no evidence of a recurrent BAC in this case, we believe, such a quick response with gefitinib therapy strongly suggest her symptom with pulmonary consolidation had come from recurrence rather than infectious disease or drug-induced pneumonitis. It is meaningful if histological type BAC was associated with a higher response to gefitinib, because BAC that is usually resistant against chemotherapy and radiation brings respiratory failure and infection due to mucus hyper secretion in the end. Of particular, an effective treatment for refractory bronchorrhea in these patients has not been established, although a few successful case reports are available . Our observation, although just single case report, may raises the possibility that the response in bronchorrhea due to BAC might be related to that association of the selective EGFR-TKI inhibition by gefitinib, because EGFR expression and activation is reported to cause goblet-cell metaplasia from Clara cells and mucus hyper secretion in the airway . So that, while it is still unknown whether the improvement of CT findings in our case comes from tumor cell death itself or suppressive effect of mucin synthesis by the EGFR-TKI action, the dramatic effect in our case brought us the hypothesis that gefitinib might be the promising option for BAC, of particular cases with severe bronchorrhea. Although one might be also anticipate a high response to gefitinib in BAC subtype because BAC has even higher coexpression of both EGFR and HER2 than adenocarcinoma , clinical markers of gefitinib sensitivity should be investigated along with molecular predictive marker. Finally, in this sense, further investigations should be warranted for gefitinib, a unique and potent new type oral anti-cancer agent.